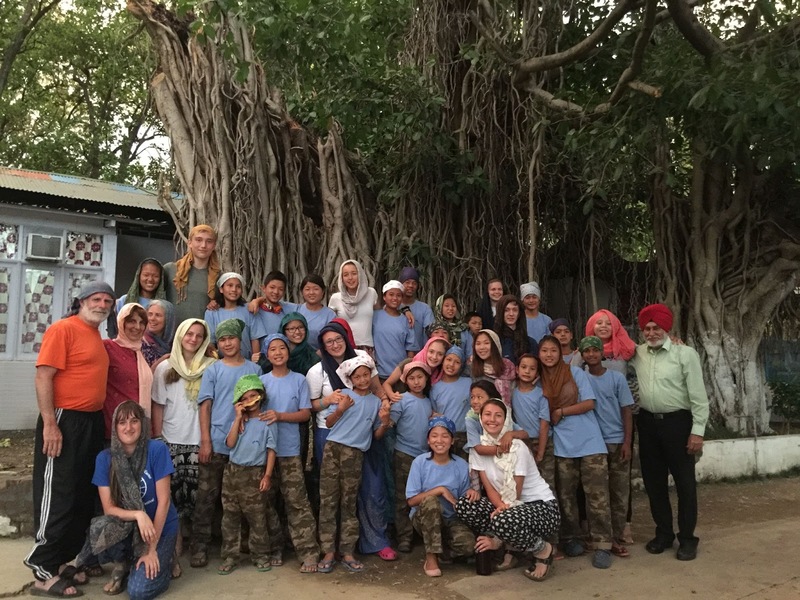 India Service Trip 2017, More news from the group. The students are settling into the simple daily rhythm of teaching and being with the children at the Joybells Orphanage and School. Below, Audrey Corrigan and Minh Pham offer their reflections on a recent trip to a Sikh temple and food in India. On May 28th, we went to visit the Sikh Temple. When we first arrived at the Temple, we took off our shoes and walked into the building. We sat down cross-legged facing the shrine. Next, a man came around with Prasad. Prasad is a holy food made from wheat, flour, oil, and sugar. We sat in silence for 10 minutes before 3 men played the drums and sang for about another 15 minutes. After the worship was finished, we sat in a big line and were given a bowl and cup. Multiple people came around and filled our bowl with a variety of different foods. Some of the foods consisted of rice, different sauces, curry, bread, beans, lentils, bananas, milk, tea, and some cookie-like sweets. I had help from one of the students to finish mine. After we had eaten we were told about the sacredness of the Temple. They told us that in times long ago tigers roamed the fields near the temple. They would come up near the temple even with people standing right in front of them, but no one was ever harmed by them. The temple also survived many powerful storms, even when glass shattered throughout the building, no one was harmed. We hurried back to the orphanage afterward because lightning was starting and continued to light up the sky strongly. On the ride back to Joy Bells all the kids started singing. All the teachers started singing along when we realized we recognized the songs. The children led the singing with American pop songs. We all sat there squished into each other, smiling, singing, looking up at the bright sky. For me, it was one of the more memorable nights here so far. 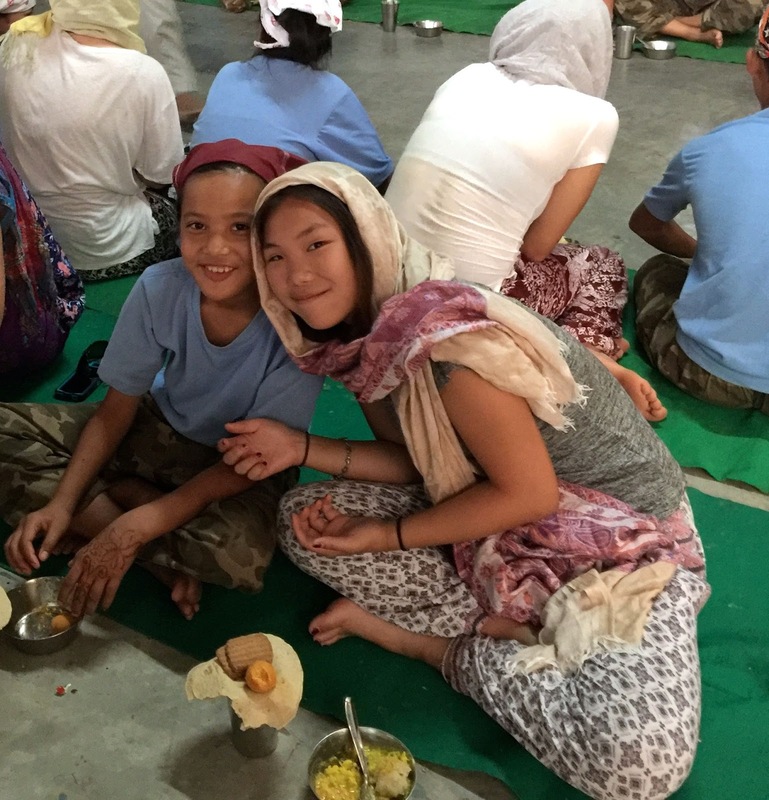 At the orphanage, we have three meals each day: breakfast, lunch, and dinner. Breakfast starts at 7 am and typically consists of fresh fruits, banana pancakes, yogurt, and chai. Since the diet here generally consists of fruits, grains, and vegetables, we brought jars of peanut butter for those craving protein. For lunch, we usually have rice, beans, vegetables, and bread. Since, teaching four blocks really tires you out, most of us get pretty hungry by lunch time (12:45 pm) and hurry to the dining room, excited to eat lunch! Dinner which is served around 7 pm at the orphanage includes delicious noodles (Jack’s favorite! ), chicken, potato, and mangos. Adapting to the food perhaps was one of my worries before coming to this trip, however, it was not as challenging as I expected. The cooks at the orphanage serve us great and delicious food which we are all grateful for. After each meal, we make sure we clean everything up and wash our plates and silverware. We also have delicious chai and biscuits every day at 5 pm. During this time we bond with kids, sing songs, and braid hair. 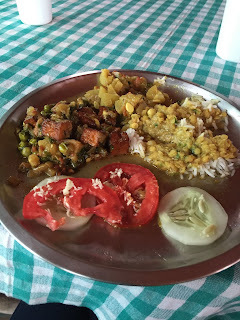 Before coming to India I personally expected lots of spicy food since strong spices were traditionally embedded in Indian culture. Typically one would expect spicy food to heat up your body which is useful during cold months, but interestingly it is also believed to have an opposite effect on your body. According to Colonel Singh, the director of Joybells orphanage, spicy food is supposed to help you handle the agonizing heat that can reach to 110-115 degrees Fahrenheit here. Nonetheless, I was quite happy to find out that the cooks at the orphanage decreased the intensity of spices for our meals since I am not a huge fan of spicy foods. Overall, food we eat here is really good in my opinion. There were definitely couple dishes that we struggled to try, however that is what makes this trip so unforgettable - getting out of your comfort zone and trying new stuff!